Home > KMS	> Inkwell’s Secret Diary – The Prelude to the Tempest! Inkwell’s Secret Diary – The Prelude to the Tempest! 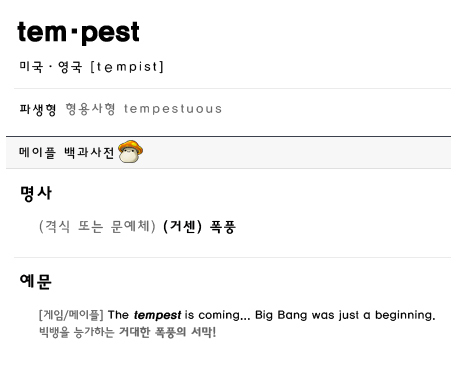 [Game/Maple] The tempest is coming… Big Bang was just a beginning. The prelude to the great tempest that surpasses the Big Bang! I think that this confirms the next game update will be called Tempest! However, what could it mean by saying that Big Bang was just the beginning…? Obviously this update will include Luminous, but what else? Can u explain luminosity ? its a new job i saw? Maybe they’ll give luminous a new island to begin in, and there will be monsters in it which are for higher levels, like Edelstein…..
oooh….What to expect…I’m hyped as well to find out! After reading Max’s blog about 5th Job i have been doing some math just now. If u noticed the level of every job advance is increasing by 10. There is a chance they might add another job advance since there aren’t many people that would actually play from level 100-200 with no extra things to do in the game so making an extra job advance at level 150 might be nice. In my opinion, the chance of KMS doing this is very unlikely but it never says a man cant dream o3o. I am also very interested in what they meant by Big Bang was just the beginning. Uh, 1st job is still 1-30. Second is 30-60. Third is 60-100. 4th is probably 100-180, considering there’s so many skills to max in 4th. 20 levels for a quick 2-3 skills for 5th job seems pretty likely. LoL u are one funny man…..
Do you have a recording of last summers live? You mean like video? if so do you have last summers still? I don’t have a recording, but I think it was uploaded on Youtube somewhere. You could try searching the comments of my post for it? I think that will be about what they have been working on, MapleStory 2. 5th job would be chaos -_- but i think it would be super awesome! Restructuring and all would be nifty. 5th Job would be dynamite, especially since some of us have brick walled because we mastered 4th Job… *insert rant here*. But how about some more high high-oriented content (perhaps effective solo options for training?)? I can’t be the only one out here who is tired of relying on others to be able to get something done. Enough speculation on my end, this ought to be interesting to see indeed. Also maybe EVEN more new Classes. like new thief or archer…. LOL -_- i made this post to, just not under my account. Cool, and maybe EVEN more new classes, like a thief res, or a archer. I agree, I think a new archer should have types of melee skill. Maybe he can use a skill when he pulls his bow into to and one side in a knife. They would still be able to use bow though, that would just be for the skill. But in the end you are right, they will make something stupid. P.s. the thing i said about the archer i got for kid Icarus :P.
They better make Night Lords more of a better mobber…..
i would love nexon if they brought in fifth job that you had to quest for skills and did like a reverse big bang, decreased exp, decrease dmg my thought are they nerfed the game to make money and it attracted negative attention and they plan to change it back as they made their fortune with the black mage content. if there will be a 5th job what lvl would it be??? Or 180. 80 levels isn’t even enough right now for some classes to max their skills (Marksmen) from 120-200, so how can you justify lowering the level range from 80 levels to 50? If I had to guess, I’d say that they would decrease the number of skills you’re given in 4th job by a few and place them into 5th job along with 2 or 3 new skills. That’s the most logical thing imo. Let’s think. In the big bang we got 3 new classes, and a game rebirth. In here we new we get 1 class and maybe 5ith job. I think fith job and a game rebirth is coming! Scratch that, this is BIGGER than big bang. Big bang has the word “Big” in it. Fith job sounds plausable. The levels have been changed, so the fith job odds go up. There was a class released in tespia, so class ods are 99%. But what else? If fith job is made, unless 5th job has only a few skills and is not an actual “Job” An incresed level limit is coming. With an incresed level limit, the bosses need to be harder and there needs to be more bosses. Wow. Sorta making a leap though, isnt it? Hmm but why would 5th job reach KMS before Tespia? I’m hoping for another damage overhaul, they need to make things harder to kill..
Hey, if big bang was just the beginning… this must be some really big patch! Wonder what other things this Tempest update might bring though? Perhaps the 3rd archer class that I’ve been waiting so long for? Ive always wanted max level increase. But that wouldnt really be fair to all those that played all that time to reach that maplestory rank. So I was thinking. Maybe new ranking system for all new characters made? I hope to see more mutation monsters, major changes to Ossyria(El Nath, Aqua Road, Ludibrium). I couldn’t think of any thing else. haha! Is there any new job IDs in KMST yet? I want new maps to train, tired of MP and PQ. I prefer 999,999 over that number any day. That number looks so ugly even though it is more damage. if they want to make a new cap they should make it 9,999,999. See what i mean doesnt that number look a lot better? in this patch i hope they renew more animations for the old classes. it would make maplestory way more interesting if they did that. oh and also i wish they would stop limiting the character customization when you create a class like for the demon slayer and Mercedes. i also hope the the rest of the Cygnus knights will get a character class like Mikhail. but i still hope it wont be gender locked. Am I the only one who hopes, that they add hd full screen resolutions? And 5th jobs could have a story to it. For the 5 heroes, they could get Awoken and the adventures could Arise to the age of Hero’s. And than there should be 5 evil Hero’s to spell out STORY. They would have to change all the maps to full HD and everything will turn really small. In order to have “Evil Heroes”, we’d need a faction system since we would then have the opportunity to play as villains, and that would require a lot to go hand in hand with it. I.e. exclusive maps and mobs since bad guys are bent on killing good guys so we’d need “good guy” mobs, possible “raiding system” (go to other faction’s place and ransack it), and a lot of storyline. Personally, I doubt we’ll get “bad guy” classes since that would require a LOT of work and development. This is really unrealistic, but wouldn’t it be cool, if there is a 5th job, that you do quests the skills, and you have to pick from a selection. So basically you get to pick 5 out of 10 quests to do to get skills for 5th job. Oh yes I would vote for that. Nexon needs to build thier game to where we dont waste so much time on useless things like traveling, relog to other characters, and also cut down on the EXP curve so that old and newer users can enjoy every single class, (among a seemingly never ending creation of new classes) by getting to lvl200 much faster, and easier enjoy its ultimate acheivement. really who has the time to grind like mad after 120 and up to 200? its now faster but hard enough trying to get to 120 on one character. but thats just me. It makes actually a long I’ve been hoping for that. But it would still need some kind of cooldown or else we could do hot times on all characters which would be cool but too advantageous. Hope to see Original 5th Job skills and not Lasers / Advanced Version of the skill. If they do that Maples wouldnt make sense if u ask me. Maplestory would make more sense but i doubt nexon would make 5 more special/op classes or maybe they will if they run out of things to do. If it would be lovely if they changed the 32 bit thing to 64 bit. So that we can finally see numbers larger than 2.14 Billion. Some new storyline would be nice. Black mage is getting kind of old. There was a kmst update. kMSt ver. 1.2.436 – Luminous Skill Changes & Tempest Advisory! JMS Exclusive Classes! kMSt ver. 1.2.435 – Final Hero: Luminous!